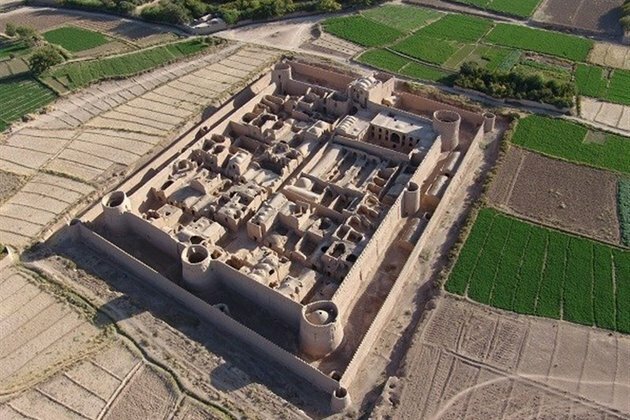 TEHRAN (Tasnim) - Mehrpadin Castle is an ancient monument of the city of Mehriz on the Yazd-Kerman road, central Iran. - Tourism news - The castle dates back to the 8th-century AH on the lunar calendar and was registered as one of Iran's national heritage sites in 1999. The castle has two walls and defensive battlements and nine circular towers; it is surrounded by a large moat. The entrance of the castle is in its southern part and the gate is decorated with metal motifs. The entrance portal of the castle is shaped like an arch with spears and reliefs of chariots with geometric patterns carved on either side of the castle gate. The interior spaces of the castle include the king's seat located in the highest part of the building, the residential area, a public or religious area, the storehouse, stables, corridors and other conjoining areas built in a remarkable and complicated order. There are several rooms on the top floor of the castle for people to stay with stables for livestock on the ground floor. The upper and lower floors which are built of wattle and daube are linked by a narrow mud brick staircase. The historical Mehrpadin Castle is an example of unique rural castles built in ancient times in plains where every resident owned one room and used it to store goods, agricultural crops, and livestock. Mehrpadin was not used as a permanent residential place and was only used when people were in danger of an imminent attack. They left their homes and took refuge in the castle with their valuables.